Good afternoon. I am delighted to join you for this Grand Opening Ceremony. I am particularly grateful to MIT for squeezing this happy occasion into my less than 24-hour physical presence in Hong Kong, in between two trips. I was just back from my London visit last evening, and will be flying off by a 4pm flight to another business trip, but I am extremely pleased to be here. Actually, when I first received an invitation to come, I thought, "What?" 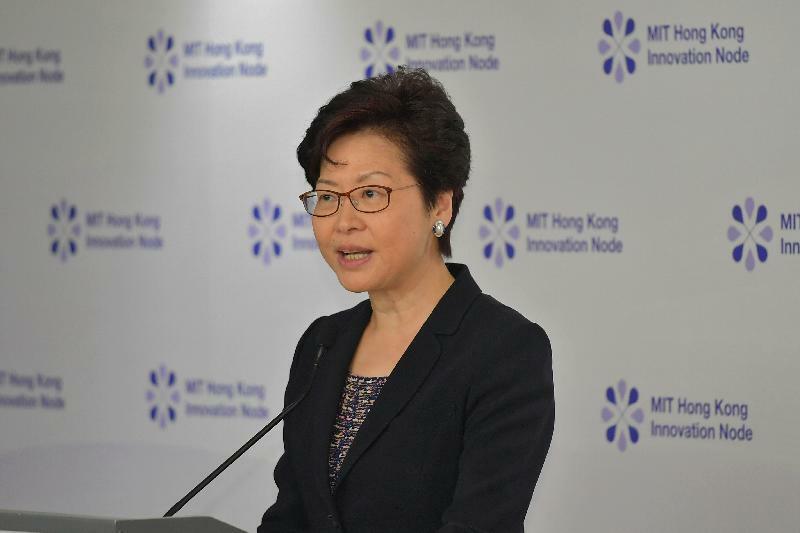 I thought the MIT Innovation Node has opened, because it has been mentioned so many times by senior officials of Hong Kong in their speeches both locally and overseas, so I thought it has been opened. But I was very pleased that you reserved this happy occasion for the new Chief Executive. First and foremost, congratulations to everyone involved in bringing the MIT Innovation Node to Hong Kong. We are all very excited to see the results of this collaborative endeavour. 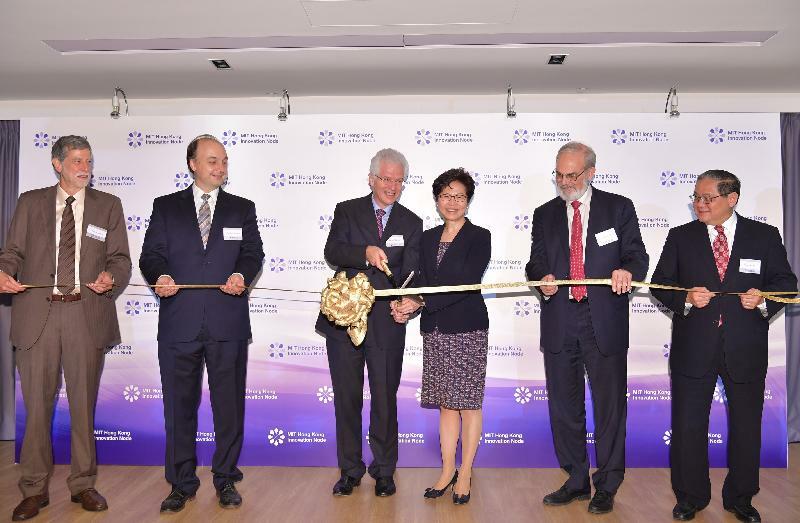 Through its Innovation Node, MIT brings more than 150 years of history to Hong Kong under the inspirational motto: "Mens et Manus", or "Mind and Hand", a motto that gives equal weight to both the acquisition of knowledge and the practical application of ideas and concepts. This philosophy resonates with Hong Kong. In Hong Kong we nurture a positive environment for innovation, technology and entrepreneurship to flourish. As mentioned in my Manifesto, my Government will be determined and confident in developing innovation and technology, and will play its role as "facilitator" and "promoter" to the full. We have all the ingredients to succeed in this area. With unique advantages under "one country, two systems", we have access to the huge Mainland market and the manufacturing hub of the Pearl River Delta provides ample opportunity for entrepreneurs to convert concepts into real products and services. At the same time, our competitive advantages are underpinned by free flows of ideas, talent and capital. Intellectual property is highly valued and it is protected under our common law system. It is true that we are short of space, Richard. But as the Chief Executive, I promise you that better things are coming. We are building a Hong Kong/Shenzhen innovation and technology hub with a total GFA (gross floor area) of 1.2 million square metres. So, if my mental calculation still serves me well, that will be 2 400 times the size of the MIT Hong Kong Innovation Node. The Government will spare no effort in realising Hong Kong's potential. In particular, we will continue to strengthen our connectivity with neighbouring Mainland cities. Soon-to-be-completed mega cross-boundary projects, including the Hong Kong-Zhuhai-Macao Bridge and the Guangzhou-Shenzhen-Hong Kong Express Rail Link will bring us closer together. We are also moving ahead with, I just mentioned, the Hong Kong/Shenzhen Innovation and Technology Park project in an area called the Lok Ma Chau Loop – a future hub for R&D collaboration. In addition, we will support start-ups at different stages of development through various funding and incubation programmes at the Hong Kong Science Park and the Cyberport. Seizing these opportunities, more and more start-ups are being launched in Hong Kong and we are regarded as one of the fastest-growing technology start-up ecosystems in the world. This ecosystem is further enhanced, of course, by the Innovation Node, providing MIT's latest best innovation practice and ideas and engaging young people in a lively makerspace and start-up accelerator environment that I just had a chance to talk to some students. We look forward to more synergistic collaborations between MIT and our local universities, helping to translate the R&D results to commercial success. So I wish the MIT Hong Kong Innovation Node every success in its new home at the Hong Kong Productivity Council here in Kowloon Tong. This district is inundated with schools and learning institutions and, most important, with inquisitive young minds – and hands – that will help to shape the future of our city and, perhaps, the world! I am confident that, in partnering with MIT, our future is very bright.